If one has to wait over 30 years for a sequel, it better be worth it and I can assure you, Blade Runner 2049 certainly fits the bill. Visually and orally exceptional, it is well acted and directed and is worth the investment. In 1982, Ridley Scott (Alien) gave us a highly stylized movie called Blade Runner. It was set in the future and starred Harrison Ford (Star Wars: Episode IV -A New Hope). Thirty-five Years later, Director Denis Villeneuve (Sicario) gives us the sequel, Blade Runner 2049. It continues the story of the struggle between replicants and humans and introduces us to a new Blade Runner, "K" (Ryan Gosling, La La Land) who hunts his own kind. It also continues Scott's original vision, which is incredible in the new 4K format that comes to stores this week. "K" is a replicant who is considered the lowest of the low as he hunts other replicants who have gone rogue. He lives a lonely existence with a hologram he brings to life as his only company. When he goes to kill a replicant named Sapper Morton (David Bautista; Guardians of The Galaxy) he discovers a dead tree with a mystery buried underneath. That "mystery" turns out to be a dead replicant who it seems died during childbirth – something no one ever thought possible. This sets the police, "K", and replicant manufacturer, Niander Wallace (Jared Leto, Suicide Squad) into a tailspin. Suddenly, everyone wants the remains and when they are stolen "K" is tasked with not only retrieving them but finding and killing the replicant spawn. As he researches the birth, though, he discovers that this lost replicant offspring is in actuality him…or is it? He wanders into dangerous territory, both physically and metaphorically, as various factions look to "retire" him. He heads to Las Vegas where retired Blade Runner and father of the replicant baby, Rick Deckard (Ford) lives to find some answers, which put both of them in danger. In the end, he finds out the truth and continues on in his life, unfulfilled. In general, I am not a fan of Gosling but I will admit this is one of my favorite roles of his. His facial expressions are nuanced and add a whole other dimension to his performance, especially considering that his dialogue, at times, is minimal. The audience can sense his loneliness and the inner workings of his mind as he questions everything he once knew. Ana de Armas (War Dogs) is lovely as "K's" virtual companion, Joi, and the two actors have a tangible chemistry. Robin Wright (The Princess Bride) once again portrays a strong authoritative female – a role she plays well – as "K's" human boss. Leto is masterful as always and watching him work is always a pleasure. Of course, the movie would have been lacking without Ford so I'm glad he agreed to return for the sequel. Two of the other main characters of the movie are the visuals and the music. The soundtrack is so haunting it delves the viewer into the world of isolation and destruction of the future. The cinematography is equally stunning, as the audience feels enveloped in that world. It is unsurprising that the film is up for awards in both categories. One of my only complaints is the over two and a half hour running time. The film could have been shortened and still kept the same look and feel. The 2160p high definition video quality truly enhances a film such as this one and showcases the aforementioned visuals. The picture is sharp and clean and the whites are crisp and the black tones true and deep. The Dolby Atmos Audio is spectacular and compliments the video quality nicely. The surround sound opens up beautifully allowing the terrific soundtrack to breathe life. The extras, which are found on the standard Blu-ray are plentiful and informative. Especially noteworthy are three short films that are a prologue to the new movie and bridge the gap between the two films. I recommend watching those BEFORE viewing this feature film. Another extra, Blade Runner 101, includes other short featurettes that review the blade runners, the replicants, the Wallace Corporation, etc. If one has to wait over 30 years for a sequel, it better be worth it and I can assure you, this one certainly fits the bill. Visually and orally exceptional, it is well acted and directed and is worth the investment. 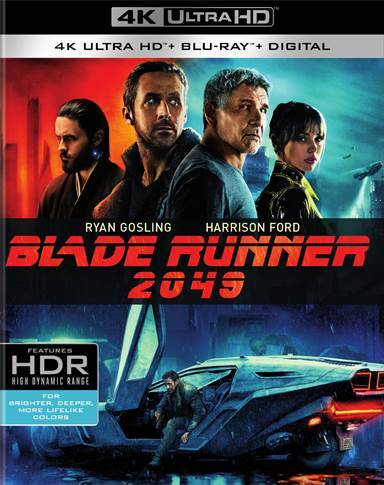 Download Blade Runner 2049 from the iTunes Store in Digial HD. For more information about Blade Runner 2049 visit the FlickDirect Movie Database.